The state of California is by far the leading supplier of strawberries in the US, producing about 83% of our country’s crop. The industry began here in the late 19th century when a variety called “Banner” was developed; production has since grown as new varieties are bred, new technologies become available, and people demand more and more of them. The life of most strawberry plants begins at higher elevations in Northern California, in sandy soils of counties like Shasta and Siskiyou. Strawberries reproduce vegetatively by sending out stems, called runners or stolons, that produce new plants. The mother plants are placed in the ground in the late spring, and all summer they send out runners, each producing many new plants. The weather cools early at these high elevations and by late September, the plants go into dormancy for the winter. Once dormant, the new plants created by the runners are dug up and transported to the strawberry fields of central and southern California, where they will produce a crop in spring. Unlike a lot of fruits and vegetables at the farmers market, you won’t find many heirloom strawberries. Though some growers are experimenting with varieties of the past, most of the types that our farmers grow are those developed by the University of California’s Strawberry Breeding Program. This program has increased strawberry productivity significantly by producing varieties that perform well in California’s soils. Some UC variety names you may recognize are Seascape, Chandler, Camarosa, Aromas and Diamante. Strawberry production has come a long way since the early days, not just in terms of varieties, but also in the development of sustainable growing practices. Just two decades ago, it was believed that strawberries could not be grown organically on a production scale. 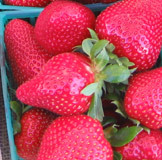 Now, most of the approximately ten strawberry-producing farms who sell at the Ferry Plaza Farmers Market are certified organic. On a conventional farm, control of insects and diseases can take a significant toll on soils, farm workers, and the environment. Large-scale conventional strawberry production is very chemically intensive, and many of these chemicals end up on the ripe fruit. According to an Environmental Working Group study, non-organic strawberries are one of the “twelve most contaminated” fruits and vegetables (with the most pesticide residues). Another harmful aspect of conventional strawberry production is the widespread use of methyl bromide to fumigate soils that will be planted with the crop. Although phased out in 2005, Methyl bromide is still used on many conventional strawberry fields through an exemption clause in the ban. Methyl bromide is classified by the EPA as a Toxicity Category 1 compound—the most toxic—because of its ability to cause neurological and reproductive harm to humans. It also causes ozone depletion. The use of methyl bromide — and the even more harmful alternative, methyl iodide — is prohibited by Ferry Plaza Farmers Market rules. Non-chemical production of strawberries is challenging, and innovations are still being developed. Farmers must find creative solutions to contend with weeds, birds, gophers, spider mites, lygus bugs, and diseases. Human power and biological solutions are often the organic answer to pest problems—using practices such as hand-weeding, the release of beneficial insects to eat pests, and crop rotation to suppress diseases. Higher labor costs associated with organically grown strawberries often mean higher prices for buyers, but organic production is much safer and more earth-friendly, and (some will argue) the fruits are sweeter. Farms that grow strawberries without chemical fertilizers in rich, healthy soils claim their berries develop more complex flavors.